File Types: JPG,PSD,All Files; File Size: 26.5 MB; Requirements: Adobe CS1+. Easily create beautiful abstract backgrounds from any source imagery. Tired of using your usual grunge and wood texture backgrounds? Looking for something new? 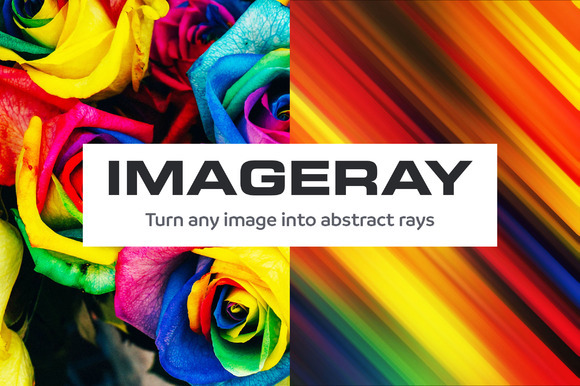 ImageRay allows you to easily create abstract backgrounds from any image. Hours have been spent testing the settings of Photoshop filters and adjustment layers in order to achieve the perfect look. In addition, many hours have been spent coming up with the quickest and easiest workflow to make ImageRay simple, quick and fun to use. - Use Any Image: Anything can work as your source image. Color, black and white, high contrast, low contrast, family photos, a picture of your cat, etc. ImageRay will work with any image. After using the product a few times, you'll start to figure out what source images will create the style you're after. - Fun: ImageRay is so fast and produces such great results that it ends up being a lot of fun to use and even a little addictiveЎЄespecially when coming up with source imagery. What if I use a picture of my cat? What if I draw a picture, scan it in and use that? What if I make a bunch of random scribbles in random colors? The possibilities are endless. Make hundreds or thousands of ImageRays! - Customizable: Want to customize your ImageRay results? You can! The effects used to create your ImageRay piece are either smart Photoshop filters or adjustment layers so you can easily adjust any of them to your liking, including the angle of the rays. - High Resolution: ImageRay always produces a high-quality 9x12in file at 300 dpi, no matter what quality or resolution your source file is. - Bonus! Sample imagery from the "Abstract Paint Bundle": http://crtv.mk/e0NQR?u=Jim_LePage Purchase ImageRay now and you'll be creating awesome abstract backgrounds in minutes. Keywords: abstract, abstract art, ray, rays, background, abstract background, energy, smart, smart psd, easy, smart object, neon, vibrant, lines.